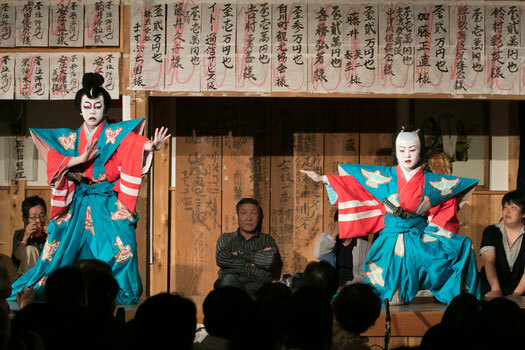 "Omuko" refers to calls of encouragement that the audience make for the actor performing on the stage. When an actor strikes a pose, encouraging shouts resonate loudly from the ō-mukō without a moment's delay. While in professional kabuki becoming an ō-mukō is quite difficult, anybody can do it at a ji-kabuki performance. Will you be brave enough to give it a try? 大向うとは　What is an O-mukou? Ō-mukō is a general term for the highest seats in the very back of the theater, furthest from the stage. Being the cheapest seats, they were used by kabuki connoisseurs who would see a play multiple times and yell encouragement at the actors on stage. The term ō-mukō thus came to refer to these individuals as well as their enthusiastic yells. The secret is to match one's shout to the timing of an actor's mie poses. At first you'll probably mess up the timing and hesitate from embarrassment, don't be afraid of making mistakes. Standard words to yell include an actor's real name, stage name (many rural actors have stage names just like professionals), or occupation. Programs handed out at ji-kabuki performances will usually include the actors' names written with furigana, so give it a try! If you are not at all sure to what to say, just say "Here comes the star!" or "Best of the nation !" Yell encouragement at an actual performance and experience the true fun of ji-kabuki. You'll be addicted once you feel the exhilaration and sense of unity felt with the actors on stage.